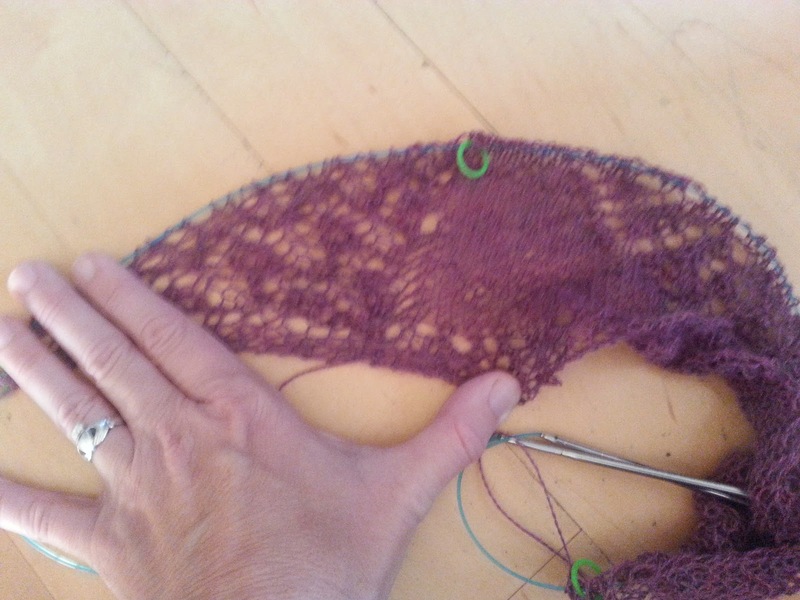 I’m about 25 rows into knitting the raspberry shawl and I’m starting to feel worried about the balance of open space from the center panel to the wings. It’s a little hard to judge unblocked. However, the transitions I created for the wings get more airy before they get less airy, so it’s just going to get more open. One problem in creating charts is that on paper, more symbols look “heavier” and less symbols look “lighter” when, in fact, with lace the opposite is often true. I really like how the center panel has been designed and I’m excited about the short row point. In fact, I even love my transitions between three related patterns for the wings. They might very well make a great shawl on their own, without a center panel. But I’m beginning to think the two don’t fit together well. I’ve become rather brutal about frogging things that aren’t working for me in yarn. I have a rather large bin of half finished quilting projects that will probably never see the light of day because they stopped working at some point. It’s empowering somehow when working with yarn that you can reclaim your fiber! 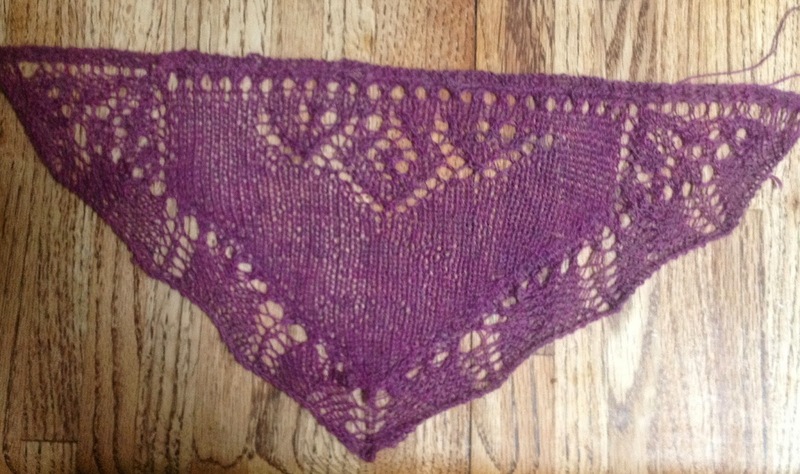 center panel design, two tiny corners of the wings of the shawl, and a bit of border. Fleegle’s system creates a bit of a change of direction of the stitches along the point, but no unsightly holes and no major disruption on the front or the back. It has a tricky bit where you knit or purl into the stitch below, but I think it’s worth the effort. Now the next question, do I like where the center panel design ends or would I rather it be pushed now into the point a bit more? Basically that’s a question of would the eye like a balance amount of white space (or raspberry heather space, in the case of this yarn) or would the extra fabric near the point pull your eye down in a pleasing way?